I was the toastmaster emcee at the Orléans Raconteurs meeting on Tuesday August 5 (2014) and there was an opening for another speaker so I decided to add a “mystery” speaker. 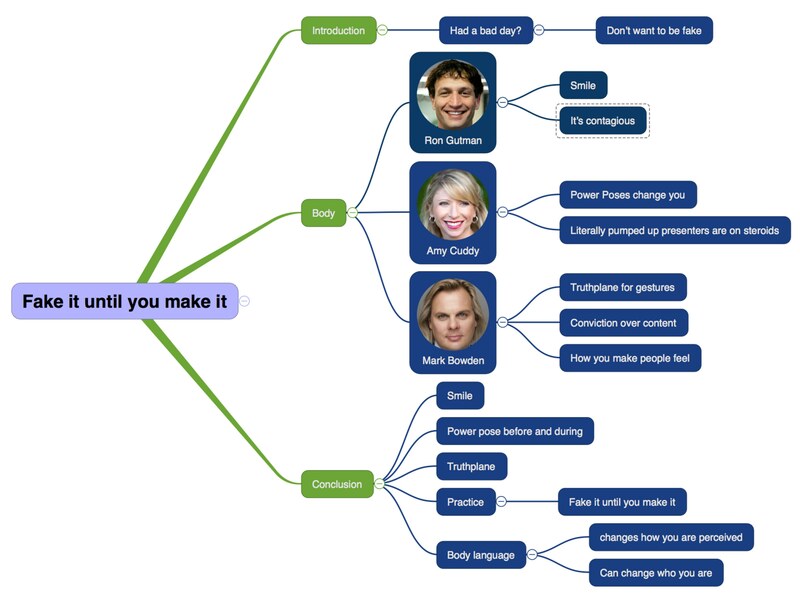 I have been working through the competent communicator manual (for the second time) and the next project on my list was project 5 “Your Body Speaks”. I prepared my speech, “Fake it until you make it” and as luck would have it the August issue of Toastmaster magazine featuring an article on body language arrived that Tuesday afternoon. Amy Cuddy on the cover of Toastmaster Magazine with “Convey Confidence with Body Language article”. I added a reference to Ron Gutman, who I wasn’t previously aware of, to my speech and noted that the article even had an illustration of “Fake it ‘Til you become it”. I decided the magazine would make a good prop and reference for the speech. All three of my sources have done TED or TEDx talks on the importance of body language. If you haven’t seen a TED (Technology Entertainment Design) talk video before they are an excellent source of high quality ideas and speeches. Amy Cuddy’s TED talk is one of the most popular and viewed TED talks. I am going to continue faking it until I make it and I encourage others to do so too.